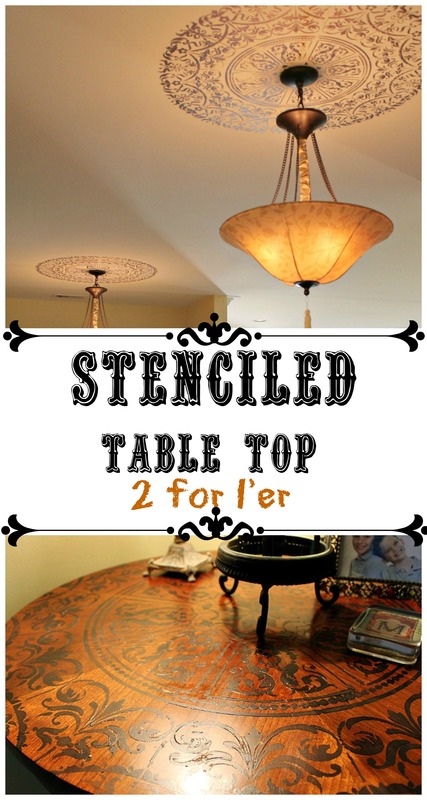 how to stencil a table top with a ceiling medallion stencil. 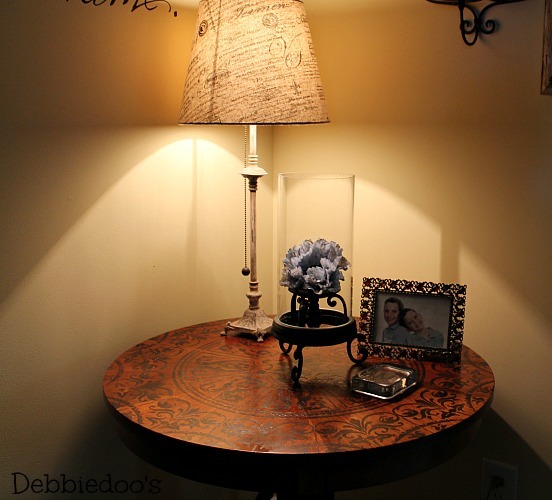 After I stenciled the ceiling medallion, my husband came up with the idea to stencil and outdated table top. 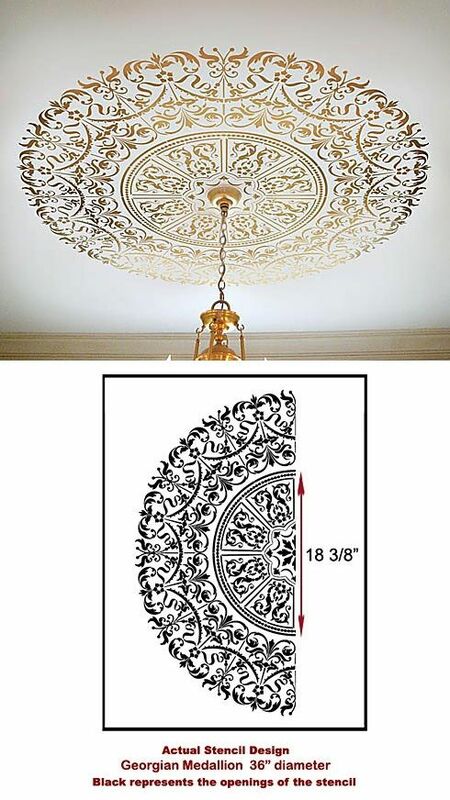 You see here the stencil came in a half moon shape,which made it very simple to work with on the ceiling around a light fixture. 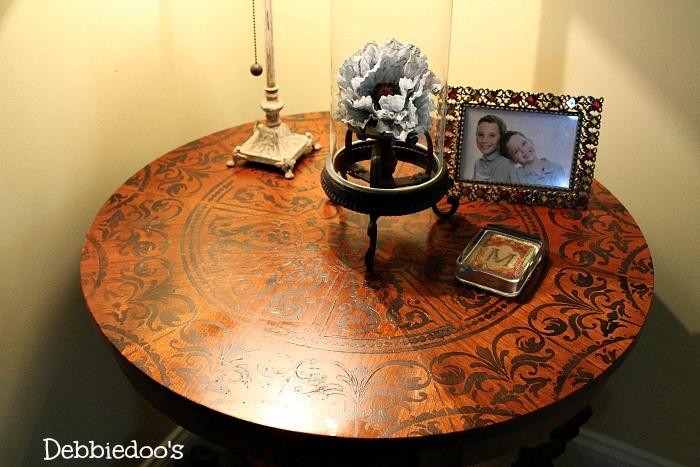 Seeing it was a perfect circle, my husband suggested I do this table that I have been wanting to paint for years. It is an Ethan Allen table that was gifted to us from my MIL. It has taken some wear and tear on the top though. That is what happens with two boys around. I used a black satin craft paint, and just rolled it on as I did the ceiling. Stencil tape, craft paint, paper towel to dab excess paint off the roller. I also did two coats of satin poly on it when it dried just to protect it from chipping. With any stencil project, I always suggest a practice run on poster board. 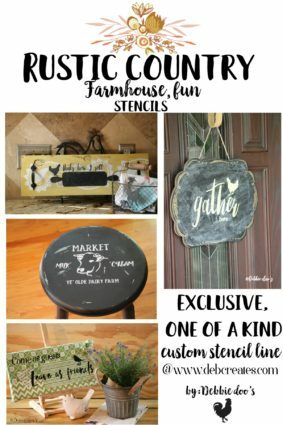 Always remember, less is more when it comes to stenciling. You never want to over saturate your brush or roller. It really does look pretty in person, and the best part was it took me all of 15 minutes! So that is what I have been up to! A simple 2 for 1’er! Hope to see you back again real soon. 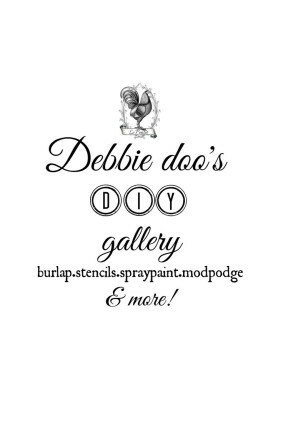 Stick around and check out my DIY gallery and my gallery of home tours under my header. You will be glad you did. 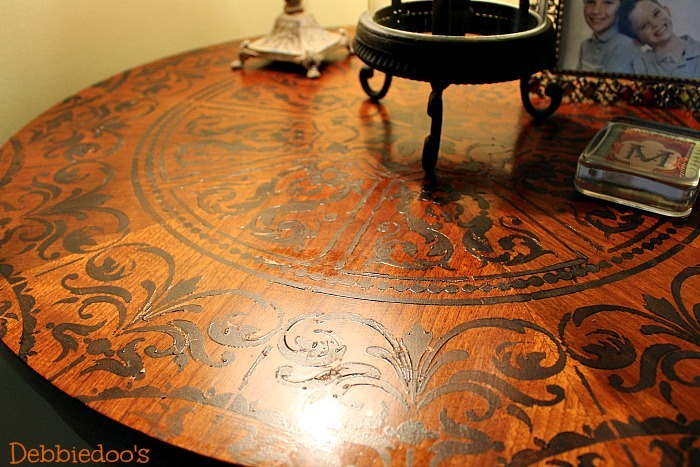 Where did you find the stencil you used on the round table. Can’t seem to find anything close. Cutting edge stencils. 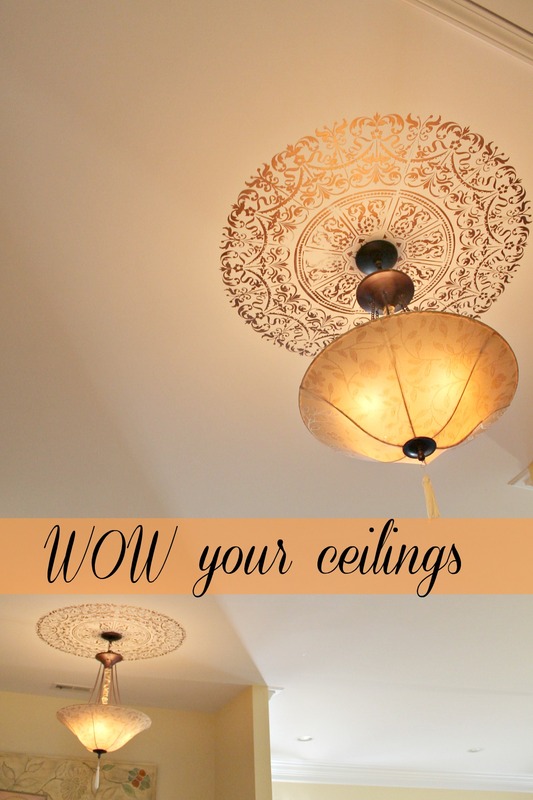 It is actually a ceiling medallion stencil, that happened to work great on the the table. I LOVE LOVE LOVE this table. 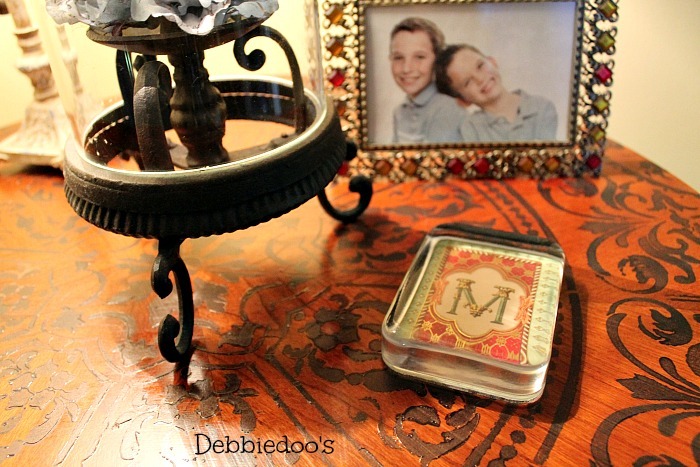 I think I might have to try this on the table in my breakfast nook! Well doesn’t he get the GENIUS prize!? That looks great!!!! Such a wonderful impact with the pattern. Wow Deb, I love it!!!! I have a low long rectangular table that houseplants were kept on ; how would I stencil something similar on it? I love this look.